Young and Gilles using the multi-beam sonar system. Until recently, finding lost cars was not part of Nate Young’s job description. 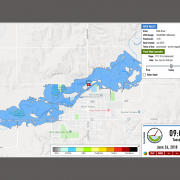 Yet that is precisely what he and fellow Iowa Flood Center (IFC) engineer Dan Gilles found themselves doing on May 11. 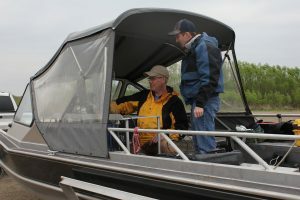 Beneath overcast skies, Young, associate director of the IFC, and Gilles, a water resources engineer, boated up and down the Iowa River, searching for a car beneath the waves. Young and Gilles were responding to a request from Johnson County Emergency Coordinator Dave Wilson, who asked them to locate an abandoned car using bathymetry—the measurement and mapping of underwater topography. Wilson had previously asked Young and Gilles to locate a car in the Cedar River that had been abandoned upstream of Cedar Rapids several weeks prior. The pair spent four hours using the multi-beam sonar system affixed to the boat to find the car. After putting together imagery of the data and sharing it with the emergency management team, they dropped a floating marker in the water so a dive team could locate it and tow it out of the water. After their success in the Cedar River, Wilson called on them again. 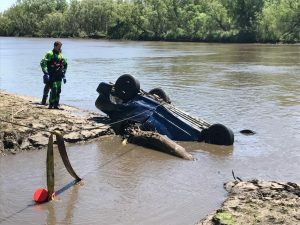 This time, a car had been abandoned in the Iowa River after plunging into the water near Swisher. The driver escaped uninjured, but the car now lay somewhere on the riverbed, the murky water making it impossible for divers to see underwater. Young and Gilles now took to the water with a complex sonar system, comprised of various instruments. One sonar instrument on the back of the boat emits cone-shaped sound pulses and has a receiver listening for return signals, while 512 receivers listen for feedback and cover a 128-degree range underneath the boat. The sonar makes 10 measurements every second and stitches them together on a map as the boat passes repeatedly over an area. Creating the sonar imagery in real time also requires accurate positioning. 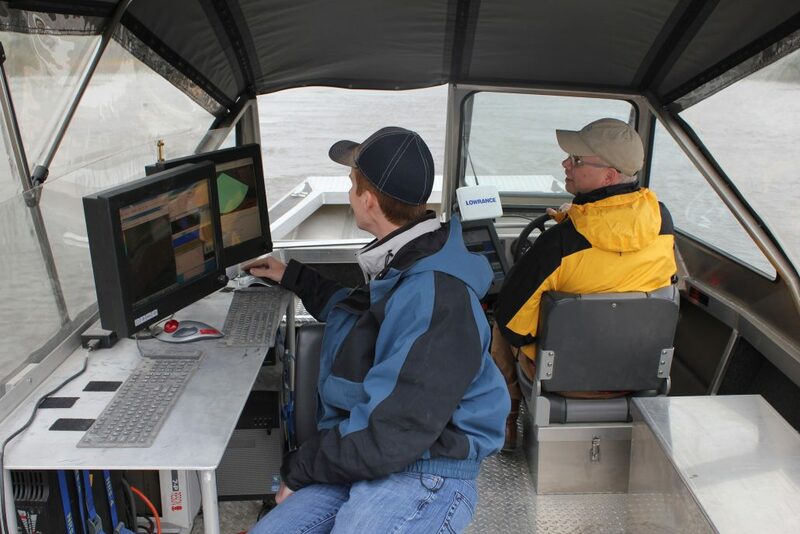 This is achieved by using three different GPS receivers—two that measure the orientation of the boat and a third that records the position of the boat. An inertial motion unit measures the movement of the boat—vertically, horizontally, and its three-dimensional tilt. All this helps the system make corrections to the sonar measurements in real time, so Young and Gilles have immediately reliable data. A member of the dive team standing next to the retrieved car. After motoring up and down the river for several hours, Young and Gilles found what was likely the car’s resting spot near the river’s east bank. They dropped a marker and sent the imagery to the Wilson and his team. Soon after, the Emergency Management dive team located the car and towed it out of the river. While Young and Gilles have proven very skilled at locating submerged cars, hopefully their services won’t be needed again for quite some time.